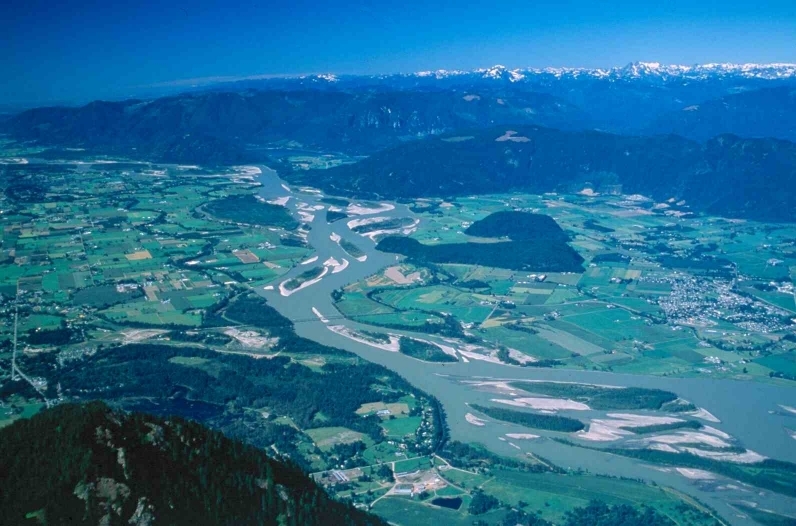 Fraser River presents a significant potential flood hazard to human settlement and activities within the Lower Mainland of British Columbia. Efforts have been underway for more than a century to protect settlements and land from the river. Between Laidlaw and Sumas Mountain (see figure), the riverbed of Fraser River is rising slowly because gravel that the river transports out of the mountains is deposited there. The rising channel bed in turn increases water levels and threatens the channel banks. These effects reduce the security against flooding provided by the dykes. There are several ways to tackle the problem that this presents. Removing gravel from the river might appear to be an obvious one. But . . . the reach has an exceptionally diverse aquatic ecosystem with high economic value. Nearly 30 species of fish are found here, including ten salmonids. The recreational opportunities of the river are increasingly recognised, and there are growing concerns to maintain ecosystems and biodiversity in our landscape. Experience elsewhere has taught us that when large volumes of gravel are mined from rivers, the river changes dramatically and, with it, the river ecosystem. Our problem, then, is to find a way to manage the river to maintain or improve the existing flood protection while maintaining the ecological character of the river. How is gravel deposition affecting the dyke design flood levels? What are the options to mitigate flood hazard? Is gravel removal a viable one? How much gravel would need to be removed to mitigate the flood hazard? How much gravel could be removed before the river and its ecosystem change significantly? What would be the best way to remove gravel consistent with maintaining the ecosystem? What is the best way to manage channel erosion problems? How long will it be before the consequences of management actions (or inaction) are evident? What might be the future consequences of changing flow and sediment supply to the river? These and other questions have been studied in our project. Reports and discussions on this website attempt to answer these questions. The website is to allow everyone to share the results of the work. The community needs these results in order to make good decisions about managing the river and about community protection from floods. Funding for this project is provided by the BC Ministry of Water, Land and Air Protection, Canada Department of Fisheries and Oceans, City of Chilliwack, the Habitat Conservation Trust Fund of British Columbia, the Provincial Flood Assistance Program, Steelhead Aggregates Ltd., Indian and Northern Affairs Canada, District of Kent, the City of Abbotsford, and the Natural Science and Engineering Research Council of Canada (NSERC).